For use with wheelchairs or walkers, this clever gadget fastens easily to your wheelchair or walker, preventing loss of your walking stick or crutch. The ferrule sits in the bottom cup and the shaft is secured by the upper clip. For use with wheelchairs or walkers, this clever gadget fastens easily to your wheelchair or walker, preventing loss of your walking stick or crutch. 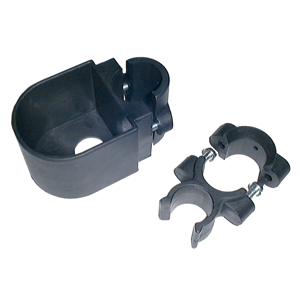 The ferrule sits in the bottom cup and the shaft is secured by the upper clip. Fitting requires the use of a screwdriver.